Golden orange, buttercup-like flowers borne on slender stems in late spring and early summer above deeply divided mid-green leaves. 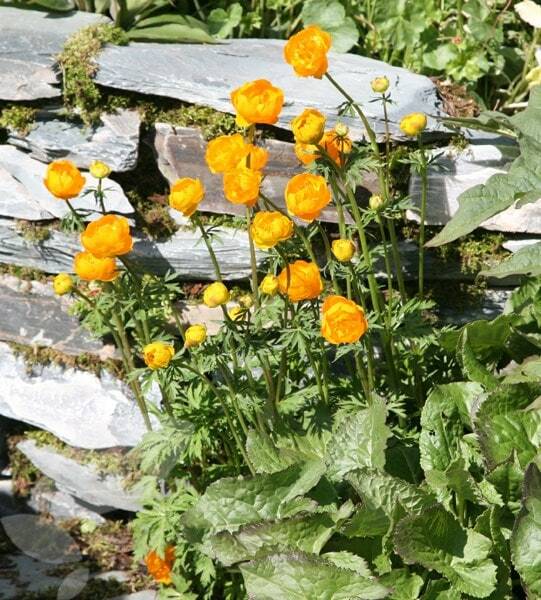 As long as their roots do not dry out these feisty golden orange flowers thrive in full sun or partial shade. Perfect for a moist border or the margins of a pond or stream. Garden care: Lift and divide large clumps in late autumn or early spring. In spring apply a 5-7cm (2-3in) mulch of well-rotted garden compost or manure around the base of the plants and water in very dry weather, to prevent the soil from drying out. I bought five of these and they did grow but they aren't thriving - this is my fault for not doing enough research and realising that they prefer very damp soil conditions in order to thrive. If they had the right conditions I think they would have been fine. We planted this as suggested with ferns, pachysandra and purple hostas with great results. The plants thrived and bloomed really well all summer. They provided a splash of interest and colour to a shady damp area, with their gorgeous golden buttercup style globes dancing in the wind about the foliage. The plant looks a bit sad after its finished, but can be trimmed down. The plants were small when they arrived but they grew well in pots. In late Summer they gave a decent crop of golden flowers on tall slender stems. Happy with my purchase and the service from Crocus. Very bright color in the garden. Strong and beautiful blossoms.